I found it. I found the manga I always needed. I’ve always loved humorous fantasy. The Slayers light novels are a favorite, and I’ve been looking for something else to add to my ‘reread constantly’ list. And you know what? Dragon Goes House-Hunting by Kawo Tanuki and Choco Aya has absolutely made that list. Dragon Goes House-Hunting is about Letty, a young dragon who isn’t very good at being a dragon at all. He’s so terrible at it that he’s let some dragon eggs get stolen by adventurers and was kicked out of his home by his father. Now Letty is searching for a new home, but no matter where he goes he can’t quite find the perfect house. On the surface, Dragon Goes House-Hunting is exactly what it sounds like – a comedic take of a young dragon who is trying to find a new home. After a string of kindhearted offers but ultimately failed attempts at moving in with the other local mythological creatures, Letty finds someone who could help him. Diera is known for his master craftsmanship. He’s also and elf, definitely magical, and possibly a demon lord. The unlikely pair find themselves in all manner of situations. One possible home is more ridiculous than the last, with Letty finding himself in one humorous situation after another. Letty is a fun character and a good twist on the dragons that are so very prevalent in much of fantasy. He’s a bit of a coward, fearful of just about everything. It doesn’t appear as if he has much experience with the outside world, and Letty fumbles his way forward for some time. But there are also quirks to this worlds dragons as a species not often seen elsewhere. My favorite? Dragons can’t fly well, because they are lizards, and, of course, lizards can’t fly. It is this very literal logic that I loved the most about this book. A great many things are taken to their extreme – if slightly ridiculous – end. Common themes, creatures of folklore and myth, and typical fantasy story situations are spun on their head. This manga is an homage to fantasy in all of its various forms. Books, video games, card games, role playing games, common tropes – everything is referenced or played upon. Yet, it is never too much. The story never feels inundated with references despite their number or frequency. Nor does it overly rely on fantasy’s common staples or tropes. There are rather fantastic, very original takes on the familiar. The three witches – seen with frequency in many fantasy and folklore – has an absolutely wonderful twist. The wise elven mage, too, is turned a bit on its head here. The reader is left in a very comfortable place. On one side are the familiar – one liners with references to books like The Hobbit and visuals referencing classic RPGs. On the other are wondrous and humorous new takes and deconstructions of common tropes. The group of valiant heroes are portrayed as both somewhat bumbling but dangerous nonetheless. While they cannot best our Dragon protagonist they are most certainly a danger to others. A small kingdom is built out of misunderstandings, misplaced reverence, and perhaps a dose of fear. It is here that the faintest hint of something more than the light, humorous story comes out. There is an underlying theme than runs beneath these comedic situations. The adventurers and heroes Letty comes across are portrayed as somewhat nonthreatening. This is firstly due to the humor, as Letty mentions that it doesn’t really matter if the dragon eggs have been stolen because a few more will just respawn anyway. Only later does this begin to have a slightly sinister undertones when Diera tries again and again to find Letty a house with strong defenses and heroic adventurers return to fight Letty. The art in this manga is both cute and adorable while simultaneously being very detailed and in the style of other high fantasy artwork. The dragon himself is often portrayed with a very soft, cartoonish, and friendly face. Other panels show heavier detail, such as Diera’s eyes and hair or the faces of the three crones. The giant sigil-like spells are beautifully drawn. The ability to switch between styles is something I really appreciated and enjoyed. 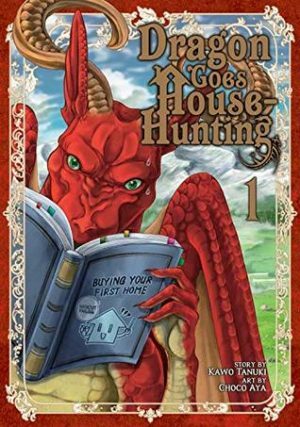 I absolutely recommend reading Dragon Goes House-Hunting by Kawo Tanuki and Choco Aya. This is an amazingly fun manga that is sure to entertain anyone whose played fantasy video and tabletop games or read fantasy manga or books.